Android phone has won the trust of global users, which plays an important role in our daily life. We have a great number of private information stored in it. However, what if you drop your phone into a swimming pool and you have to perform factory reset, which will delete all the files? Bad experience always comes without any warning. To backup Android files now is not still too late. Here are many Android backup apps for you. Samsung Messages Backup is a professional Android assistant software designed for Android files management. You can use it to backup your whole Android phone with one click. Its user-friendly interface makes you understand the operations well. Following the easy prompts, you can transfer files from Android devices without any data loss. The transferring process can be completed in 3 steps. Step 2. Run the program and connect your phone to computer. A screen shown below will appear on your computer to let you enable USB debugging. Just follow the prompts to go on. Once your Android phone is detected successfully, you can see an interface as following. The files of your Android phone are listing on the left. Step 3. Please go to the file category and select the detailed items to backup them from your Android. You need to select a folder on your computer to locate the data you exporting. After that, you can check your backups on local folder. What's more, you can print your exported contacts and messages. Besides, you can backup a whole Android phone by one click, please go to "Super Toolkit" > "Backup" > choose the location and click "Back Up". Many hot apps on Google Play store are free for Android files backup. You can backup Android files with apps conveniently at daily time. Here are five powerful apps. Google Drive offers a 15GB cloud storage for files saving, is a very famous app for android files transfer. You can use this reliable app to backup your Android phone and simply share files. Different types of data like videos, photos and documents can be saved safely. Supported by many platforms like Google Photo and Google Docs, you can use other apps to check the files saved on Google Drive! Also, it can be friendly used on Android devices, tablets and personal computers. Helium - App Sync and Backup is one of the best backup apps for unrooted Android phone. With it, you can backup apps, apps data, contacts, messages and call logs. Unrooted Android phone needs to install an extra desktop app to work with mobile app while connect your Android phone to computer. This free version allows you to backup apps and data to pc and SD card, while paid version permits you to set an automatic backup schedules, sync data from Android to Android and backup Android files to Google Drive, Box and Dropbox. Titanium Backup is an Android backup app for root phone, which widely supports almost all Android versions. You can use it to backup all protected apps, system apps and external data to SD card, including the apps data, SMS, contacts and so on. The paid version offers more features for cloud syncing, automatic backup, batch restore and app freezer. 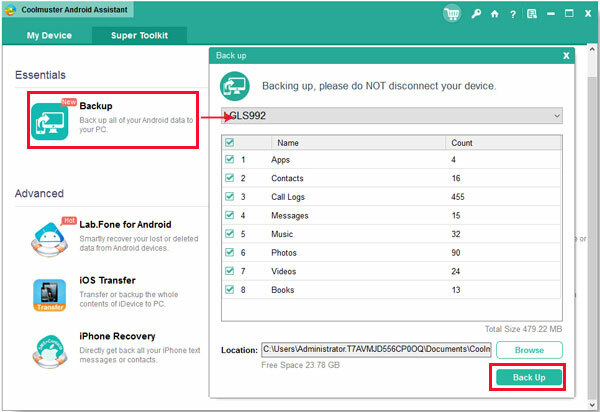 Super Backup & Restore is a fast and free backup tool for both rooted and unrooted phone. You can backup contacts, SMS, call logs, apps, bookmarks and calendars to SD card and Gmail. You can restore these data back easily after a factory setting. But if you want to recover apps and apps data, you need to root your Android phone first. SMS Backup & Restore is an app used for SMS simple backup and restore. With it, you can backup text messages in XML file format, which can be read on your computer. So if you need to print out the text messages, this app is a good choice. Besides, the backups can be uploaded to Dropbox and Google Drive for safe store and sharing. Android wins the majority of mobile users and there are rich options for you to backup Android files with apps freely and conveniently. You can pick one as you like to backup your Android phone. However, there are still some limitations while using these hot apps. Samsung Messages Backup is a one-stop solution, which offers all round functions for you to manage your Android device as well as backup files in a professional way.